We just completed a 4-day SIM3 training seminar in the south side of southern California. UC Irvine is located very near the ocean, which makes one wonder how folks could study when the surf’s up. It is also right next to John Wayne Airport. Naturally I flew in and out of LAX, and drove the hour down to the other airport. Why? Because I live in St. Louis, which USED to be an aviation town (ever heard of Charles Lindbergh, McDonnell Douglas or TWA? – all just museum stuff now.). We had a good sized class of 19, including grad students and professors from UCI, some engineers for Creative Technologies ( a rental house specializing in corporate), some freelancers and two special guests: Daniel Lundberg and Jamie Anderson. There were 3 people (not including Jamie) who had attended my seminar previously and were returning. This is, for me, the highest honor and I am very grateful for the support of Will Nealie (whose photos are shown here), Chuck Boyle and Szilard Boros. 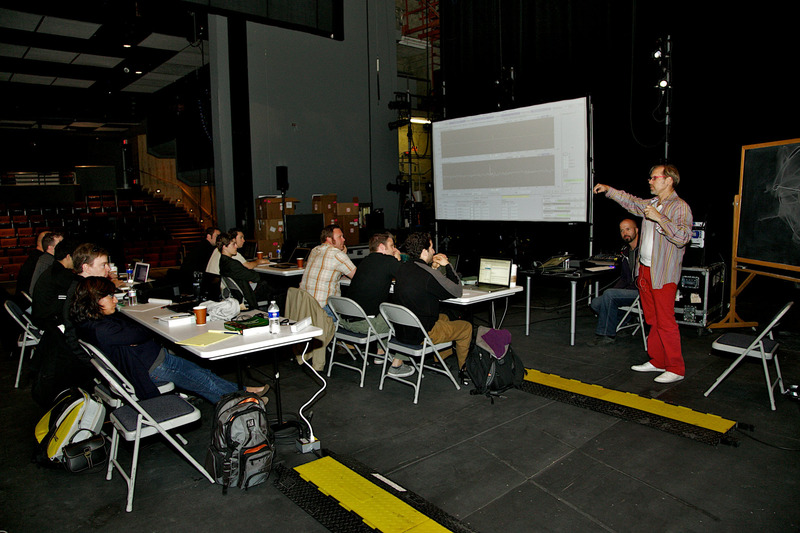 We were fortunate to get to do the seminar on the stage of the 300 seat Claire Trevor Theater. This allowed us to measure first in the controlled circumstance of the near-field on stage and then work our way out into the house. As an added bonus we were allowed to measure (and re-design and retune) the house system, which had an up-to-date line array type system of 8 x Meyer M1-Ds. The class moved along very smoothly. We covered LOTS of ground and the acoustics of the hall were very favorable so that students could get a look at what real systems can do in a good hall. 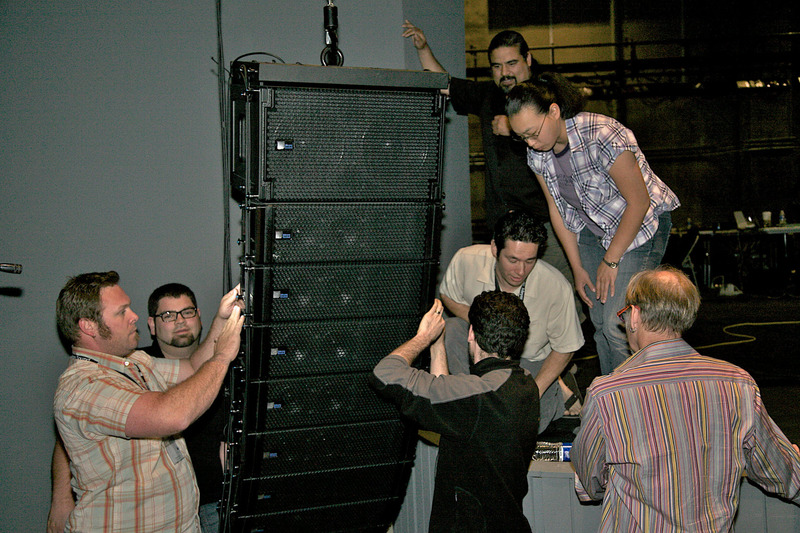 The class progresses in complexity over the 4 days, beginning with measuring a processor, then on to a near field single speaker, adding a subwoofer , near field arrays, distributed arrays and then out in the house where we design a full system and tune it. All the while the progression of complexity is underscored by the theory behind the data. The number one focus point of a SIM3 seminar is understanding what the data says and WHY they data says that. Proper diagnosis must ALWAYS come before treatment, and all treatments need follow-up testing. If they don’t work then get started on a new diagnosis. SIM school tunings are never rehearsed so when something shows up on the screen, we all are seeing the data for the first time. There are always surprises and this was no exception. In the course of the tuning here we found that our original design had too much coverage for the room. If we had gone to MAPP On-line or even used a simple protractor on the plan view of the room this could have been seen in advance. But PURPOSELY we did not use those tools to find the answer. It is better for the learning process to see how unkowns can be decoded by the analysis methods. The “Main” array was 2 x UPJ-1P in a coupled point source, located at the house left stage edge. Our goal was to cover evenly across the room – a straight horizontal line along the 3rd to last row. 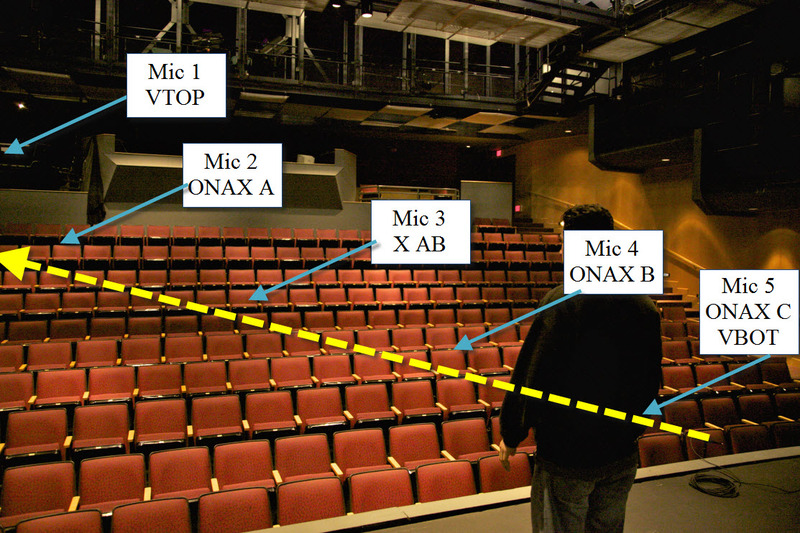 As we measured the 1st speaker across the row we could see that it cover ALMOST the entire width…. almost. Adding the 2nd speaker was WAY too much, leaving it off, left us 4 seats short of the aisle. Conclusion: Our design was flawed. (This made it just like a REAL gig except that the designer’s ego was not at stake). It is much better (as a learning experience) to use the SIM 3 Analyzer to prove the design was wrong and to force us to consider the optimization options that had the highest prospect for success. If only we could wave a magic wand an turn this 80 degree speaker into a 50 degree speaker! Oh….. WE CAN! In this case we rotated the UPJ-1P horn on the 1st speaker (they are 80×50 rotatable) so that we got 50 degrees of horizontal coverage for the “A” speaker (the longer throw). This covered enough of the room to make a successful, smooth transition to the B speaker. Then we added the “B” speaker – too wide again until we rotated its horn as well. 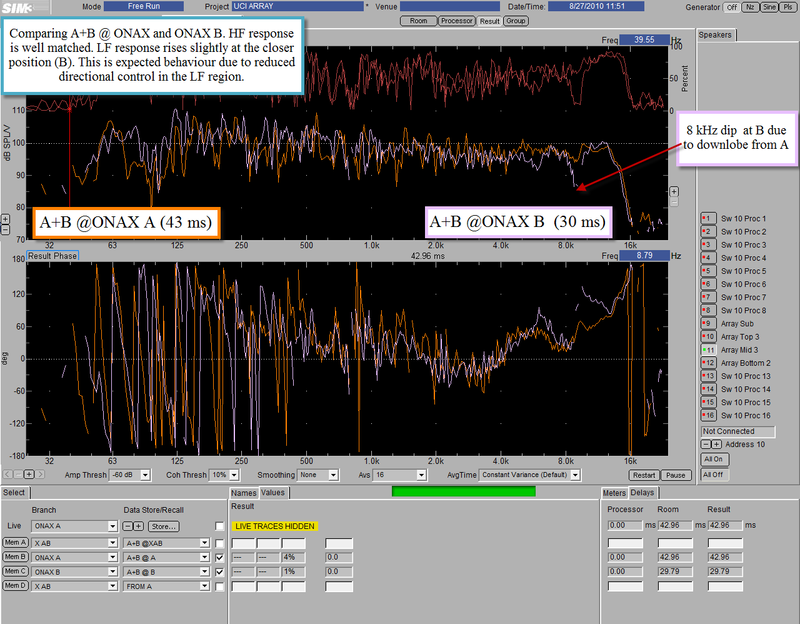 The end result was even coverage across the straight line of the 3rd to last row within 1 dB. 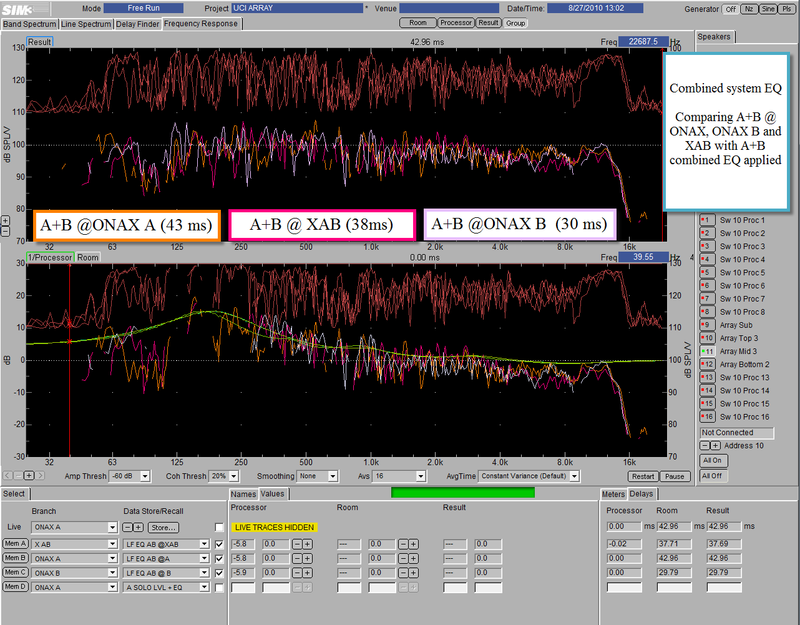 The process involved measuring on axis, at crossover and off axis until the splay angles were optimized, the eq’s set (individually and together), levels set and delayedso they were phase-aligned at the crossover. Then we added the subwoofer to the array in both an overlapping and non-overlapping mode (different delays were needed for this). Finally we added a small delay speaker to extend the coverage evenly into the corner. We even took a few minutes to show the effects of adding excess delay (the side effects of the Haas Effect) and watched as the coherence and combined level at the delay location became worse than if the delay speaker had been turned off. This is always an eye-opening moment at my seminars. Because the class moved along so quickly we had the luxury of extra time to take on the house system. 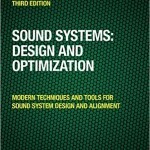 This system is made available for students to re-design, re-hang, re-angle, re-tune, re-etc……. This particular config had been specified by a student AMA (against medical advice) so the professors were quite interested to see how it would look under the scope. The answer: ________________________flat line. The horizontal orientation was the most severe in-tilt I have ever seen (OK I am pretty new to this but I have seen a FEW systems). It was such an inside job that the Left side of the PA missed most of the…………. left side. The mix position was in the very rear of the house right side. From a horizontal standpoint the left speaker was pointed at the right wall IN FRONT of the mix position. If you are having trouble visualing this here is a pic to help. 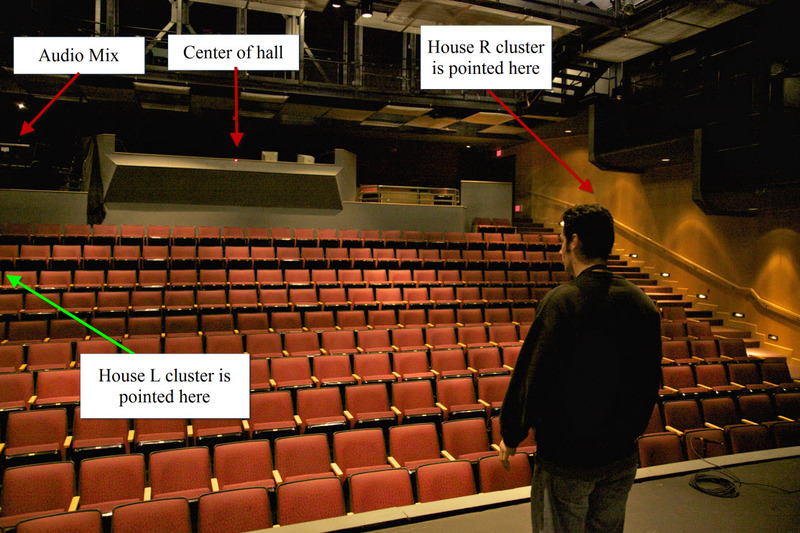 So we measured and found that the left cluster was more than 6 dB louder on the house right than on the left. Obviously the speakers would need to be opened outward. We had, however, spent the previous 2-speaker tuning focused on the horizontal plane interaction between the pair. Here we had 8 boxes in the vertical plane– that is what we wanted to see – and we had 5 mics running from top to bottom in a diagonal line where the speaker was pointed. As it stood, nobody knew what the current vertical angles of the cluster were. We had the 8 boxes wired in 3 zones 3-3-2 as an ABC array. It was offered to bring down the array and see the angles – then we could play in MAPP and see the response…….NO, NO, NO. Much better to turn it on and see what we have. This way we can learn how to hunt down an array in the wild. We know these 3 subsytems are out there – but where? Terminology sidebar – ONAX (On Axis), X (Crossover), VTOP (Vertical top),VBOT (Vertical bottom). Before we get to any tuning, we dummy checked each mic and speaker to make sure we had everything wired right. In the course of this we set the delay compensation for each mic and they ran from around 50 ms to 13 ms so we are looking at near seats that are around 12 dB closer (a ratio of 4:1) than the rear seats. The array will need to overcome this difference in proximity. So we began with just the upper system “A” on (the top 3 boxes). 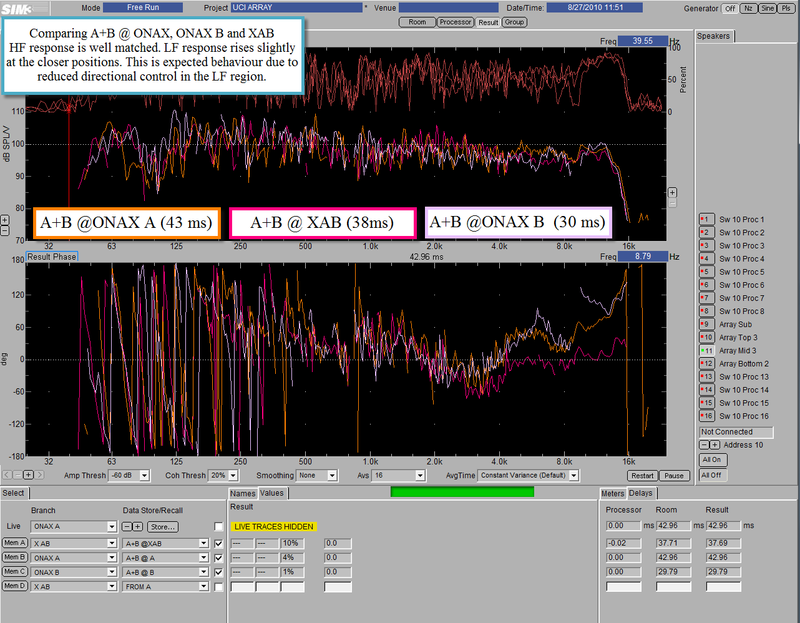 We compared Onax A, VTOP and XAB positions. VTOP (around the mixer ) was a disaster. No HF, no coherence and the far side much louder than the near side. Perfect mix area!!!!! XAB was down slightly from ONAX A so now we knew (vertically) where “A” was pointed: Too low. The cluster was already very high so we can’t move it much. The real answer would need to be getting some up-angle in the array. This would require some real-world rigging and this was not going to happen in our short time frame so it does not seem that we will fully solve the mix position. Onward. We moved the ONAX A mic up and down a row and found that our original position had the most level – we had found the center of A. We eq’d it and stored it as a reference level. Next begins the search for B. We looked at the ONAX B mic and moved it up and down until we found its high-water mark. The level at B was stronger by about 3 dB (compared to A). It was also about 3 dB (70%) closer. This made it obvious that the splay angles chosen for this array were wrong. How did we know? The job of the different splay angles is to create a matched level at different distances. Here we were seeing that as we got closer, it got louder – the expected propeties of getting closer to a symmetric, non-directional source, not one that is creating asymmetry in the vertical plane. We eq’d the B system and reduced its level 3 dB. Next up was the bottom two boxes, system “C”. This system covered the front rows REALLY well. It was 7 dB louder than at the back and we were still in the 4th row. It got even louder up closer but we gave up. Conclusion: The cluster system needed to generate around 12 dB of level difference from top to bottom. It actually achieved 3 or 4 dB. Time for the cluster to come down and redesign the system. We have no drawings of the room. Not even a napkin sketch. The UCI internet is not getting through to my laptop. We are going to have to go it alone. This is what we know (a) the cluster is too low, we have more than enough angle to reach the bottom and we need 12 dB more level at the top than the bottom. This means that the splay angles for the C section need to be at least 4x wider than the A section. So how do you design a line array with no Manufacturer Official Line Array Calculator, no Mapp On-line, no drawings? We need to know the angle spread from top to bottom, and the difference in range from top to bottom. So we looked at the existing angles and found that the overall angle spread was 40 degrees. We know that was more than wide enough. We know we have a 4:1 distance ratio. So we need 35 to 36 degrees of spread – we have 8 boxes (7 splay angles) – the average splay angle will be 5 degrees. (5 deg x 7 = 35 deg). We know the widest angle we can get for an M1D is 8 degrees. If we have 8 degrees at the bottom and 2 degrees at the top (a 4:1 ratio) we will approach our 12 dB range ratio. Add ’em up (2-2)-3-(6-6)-(8-8) = 35 degrees. System A = is 3 boxes at 2 deg (a 6 deg speaker), 3 deg splay to system B (a 12 deg speaker) and then on to C (a 16 deg speaker). Here is a picture of the design in progress: Yes – that is the AS-BUILT paperwork under my hand. The new angles were put into the cluster and up it went – pretty much as high as it could reasonably go (about a foot or two higher than before) and we resumed measuring. This went very quickly now. The center point of each subsytem was easy to find since they each were made up of a symmetric angle set. The center of A was at cabinet #2, the center of B was at # 5 and the center of C was between 7 and 8. Each system was eq’d separately and levels set. The level tapering needed to bring the lower systems into compliance was 1 and 3 dB respectively, a far cry from the 3 and 7 dB previously. The systems were combined – first A & B and then C was added and a very uniform frequency response and level was created over the space. The level from front to back (back being the top row) was now 1 dB. The mix position still sucked – but we knew we could not save that without a rigger. 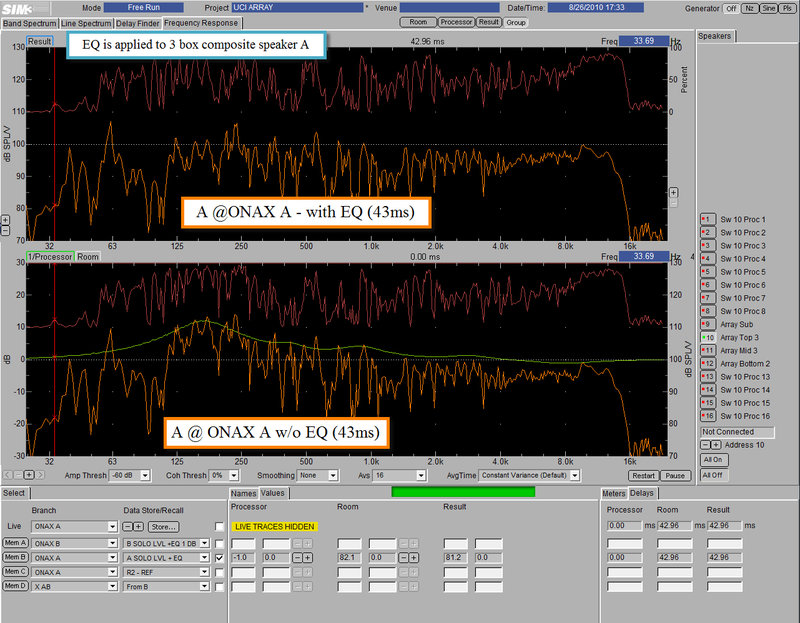 First we looked at the ONAX A position, and EQ’d it. This will be our level/spectral standard going forward. The next step was to look at the response at the mix position. We expected that things would not be improved much here since we were not able to aim the array up high enough to hit here……..and we were not disappointed. Well I mean we were not surprised. The EQ applied is slightly different for A and B respectively. The difference is minor because both “speakers” are comprised of 3 elements. The splay angle is different which creates a different summation gain of 3 dB – the correct amount to compensate for the difference in distance. Above – You can see the addition at A that occurs when B is added. The response shows no loss but the gain varies with frequency. As frequency falls, the percentage overlap increases and the addition increases. At 8 kHz the percentage overlap is so low that we see no addition. By contrast, at 125 Hz we see 6 dB addition. 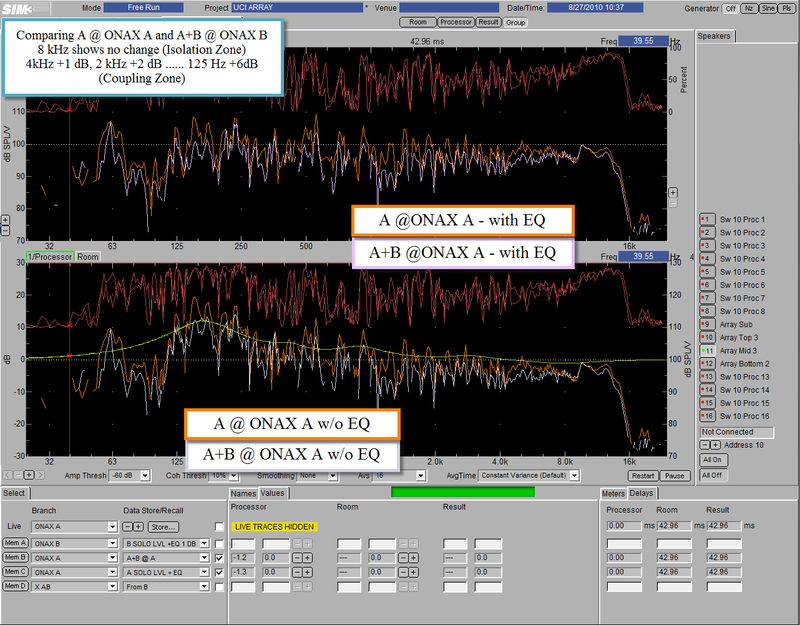 All frequencies between show gain values between 0 and +6 dB. This is a great example of 3rd order speaker behavior. 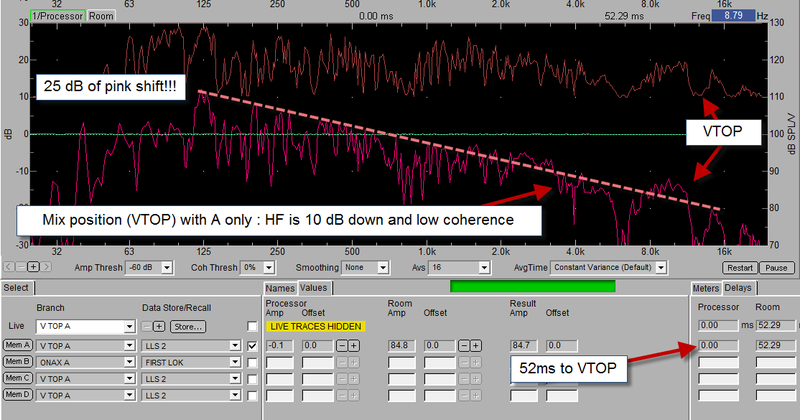 Above is a zoomed look at the uniformity of the HF levels. Once A and B are combined we look at the LF region to see where the coupling was shared in both directions. Frequencies that were boosted in all locations can be equalized by matched filters in the A and B sections. In this case a 160 Hz filter was applied. Below we have a zoomed in comparison of before and after the AB Eq was added. The screen below shows how we have restored the Combined AB response to the same shape as our initial A solo reponse. 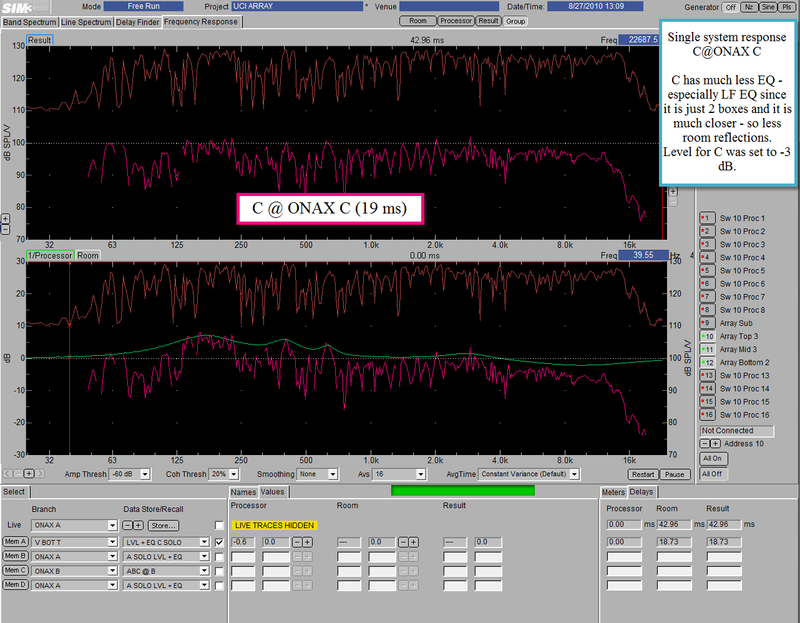 Now that AB is complete we turn our focus to C. Speaker C (2 boxes) was EQ’d as a soloist and it’s level set to match the ONAX A standard. The solo EQ response appears below. 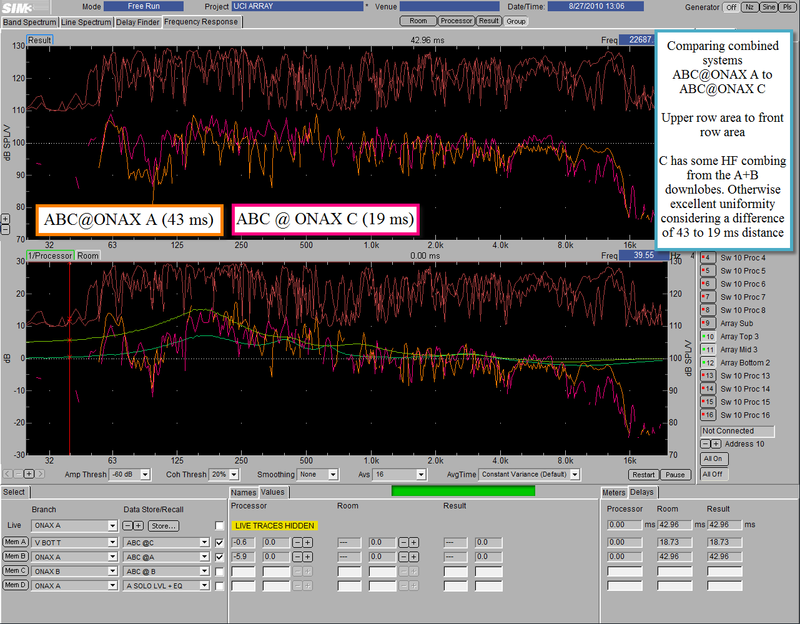 The response below shows the full combined response ABC at ONAX A and C positions, giving us a clear view of the difference between top and bottom (not much!). The distance ratio between these two locations is around 8 dB! Finally we sell the full system ABC at its 3 main locations. Was this the best way to design a system? I would not recommend it, if you have the option of drawings etc. But in the end we still have to test it – and that is where the final design comes from. In this classroom setting we made the tuning process drive the design. What we learned from our data was translated into an updated design and this was then measured. The result was a winner. This process, in a few hours was a distillation of 25 years of work for me. Everything I I ever learned about design came from the process of trying to tune an existing design, and learning from it. There are additional class photos which will be placed in the “Seminars” Page on the right of this blog page. I did manage to bring home some good data from this tuning so I will add those to this post later. Soon… I promise. Wow, I’m jealous. My SIM class was in a tiny room! It is great when we can do a class in a performance space instead of a traditional classroom/seminar space. We are trying to get out next Germany seminar booked into a performance space……………still hoping. Me 2… my 6o6’s class was in an empty fish tank filled with noisy air conditioned. I thought it was a very FULL fish tank! Thanks for sharing those twentyfive! Regards the zoning (ABC), done to have greater control of processing, ie: delay level eq? If so was there sufficient processing installed or did you have to supplement the existing install in order to arrive at the finished tuned system? The system had enough flexibility as it was installed so this made it easy. The speakers were all self-powered so that made the re-patch easy. Because this system was a teaching sound system, it was left flexible for students to re-hang, re-patch and re-tune. Therefore our changing it did not upset anything. That was a great opportunity for us – to be able to experiment without worrying out it being permanent. 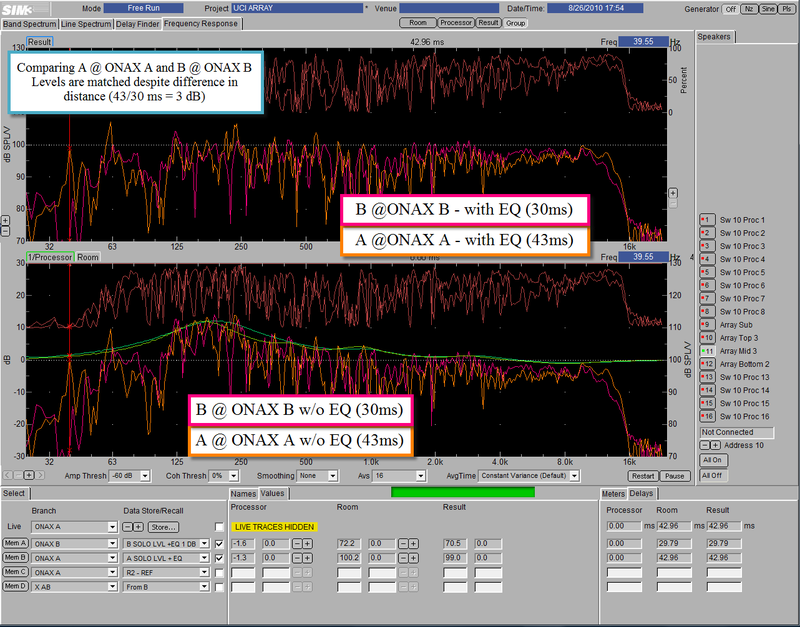 When you are searching, in an array like this one, for the ONAX A, B or C, or when you are setting the levels of the different zones (A,B, or C), do you look only the level of the HF (more or less, from 2Khz upwards) or you look the level of the overall band spectrum? And is it necessary, in an array like this one with so much overlap, to adjust the time settings in the XOVER AB and XOVER BC ? Thank’s for sharing with us your experience! Nice to hear from you. Level setting is always tilted in favor of the HF response – whether it is ABC method with a line array or ABC method with single boxes. Level setting alwys works best in the parts of the frequency response can achieve isolation zone summation. In the case of a box with an HF horn the range can be several octaves – 2kHz and up like you say. In the case of line array boxes the the isolated freq range is much smaller – and varies with quantity and angle. If “A” is 5 boxes at 1 degree, the isolated range will be small and high – perhaps no lower than 4-8 kHz. If “C” is 3 boxes at 8 degrees it is MUCH wider and the freq range where you will see the HF level flatten out will move a lot further down. Delay setting at xover is applicable to the ABC method for single boxes. When you make ABC composites out of multiple boxes (such as line arrays) then delay taper no longer applies. The reason is that the composite speaker is spread out over an area of multiple drivers. The time center is at the center of the composite set (e.g the 3rd box of 5) but the xover is between the bottom box of A to the top box of B – which is a VERY small amount of time. I was already planning to make a post on this subject – with drawings – so this will help me to go forward on this.